For toddlers, every boo-boo feels better when covered with a fun adhesive bandage. However, removing band-aids is another story. 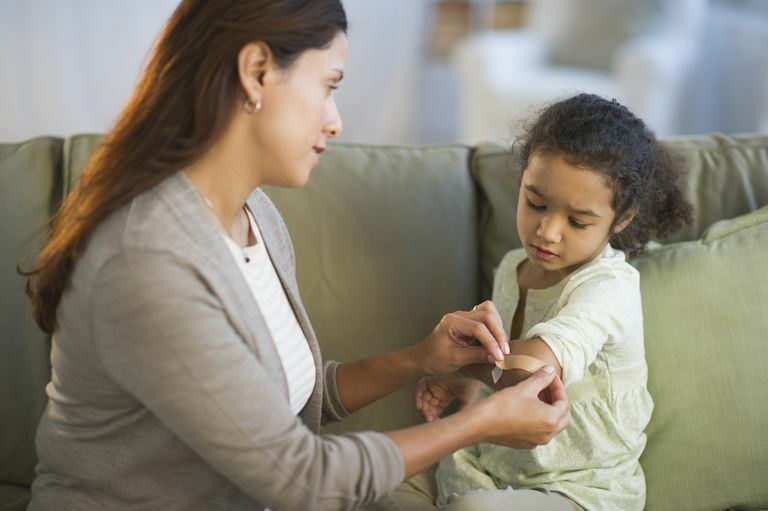 Even if you're quick, yanking off a stubbornly-stuck bandage can be painful for kids. Luckily, there are some simple tricks to make removing band-aids a breeze. And the best part is that all you need is a little patience and some common household items. Create a tab for better control. If you decide to just rip it off quickly, be sure to first peel back one edge of the band-aid. Next, pull parallel to your child's skin. This will encourage the adhesive to release rather than stick to the skin. To ease your child's anxiety, have your little one take a deep breath and then let him know that you're going to pull off the band-aid on the count of three. Remove the band-aid after a bath. Giving your child a bath with his band-aid still intact can both clean the surrounding area and make removal easier. Water weakens the adhesive of the bandage, causing the band-aid to either fall off in the tub or peel off easily once out of the bath. Soak a cotton ball or cotton swab in baby oil. Next, gently rub it over the bandage until it falls off. You can test to see if it's working by slowly peeling a corner of the bandage. If you don't have baby oil handy, olive oil, petroleum oil, or baby shampoo will work, too. Fun tip: Add a little food coloring to the oil and ask your toddler to help you "paint" it on the band-aid. Dissolve the adhesive. Dabbing rubbing alcohol on the bandage will slowly dissolve the adhesive and can be used to remove any adhesive remaining on your toddler's skin. Freeze the adhesive. Wrap a few ice cubes in a paper towel or thin towel and gently rub over the band-aid. Ice works by making the adhesive brittle, which in turn, makes it easier to pull off of your child's skin. If after wearing an adhesive bandage for a day or two, your little one develops an itchy, red rash in the shape of the adhesive bandage, he may have an adhesive allergy. This reaction is caused by contact dermatitis as a reaction to the adhesive. You may want to discuss this with your pediatrician at your next appointment. The diagnosis of adhesive allergy is made by the use of patch testing, which involves the placement of various chemicals onto the skin, usually held against the skin using a paper tape. The chemicals themselves are often contained within a small metal cup, usually smaller than a dime. Patch testing can confirm what is already suspected based on a person's symptoms, but also identify the particular chemical that is causing the contact dermatitis. Widman TJ, Oostman H, Storrs FJ. Allergic Contact Dermatitis to Medical Adhesive Bandages in Patients Who Report Having a Reaction to Medical Bandages. Dermatitis. 2008 Jan-Feb;19(1):32-7.. doi:10.2310/6620.2007.00002. How Can You Keep Your Kids Safe and Infection-Free While Swimming?